A vitamin is an organic compound required by the body for essential metabolic reactions. They are bio-molecules that act as both catalysts for and agents in chemical reactions throughout the body. Vitamins are classified as either water-soluble or fat-soluble, and they are vital for the normal growth, development and maintenance of cells, tissues and organs that make up the body. The human body requires 13 basic vitamins, four fat-soluble (vitamins A, D, E and K) and nine water-soluble (8 B-vitamins and vitamin C). Because the body doesn’t store most vitamins, we have to consume them consistently to avoid deficiency. Vitamins promote the fluidity of blood, aid in blood clotting, and support the structural and circulatory systems. They act as coenzymes to carry chemical groups throughout the body, improve immune function, maintain the nervous system, promote energy, maintain good vision and support the body in times of stress. Some vitamins also possess powerful antioxidant properties. enzymatic reactions and other vital body functions. Vitamins and minerals act as the building blocks of health. They lay the foundation for everything that goes on inside our bodies; thus, consuming sufficient amounts of vitamins and minerals is of the utmost importance. 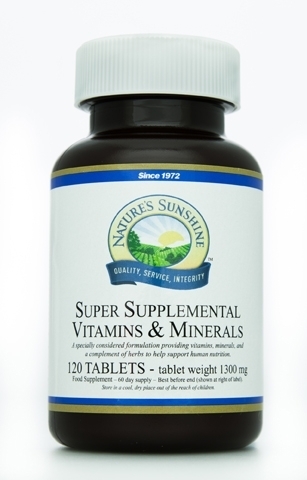 Nature’s Sunshine’s multivitamin and mineral supplements provide complete, balanced nutrition, offering 100 percent or more of most vitamins and generous amounts essential minerals.